Bottles were shipped from vineyard in California to be photographed. The photos are posted on the company website for distributors to download for POP displays. 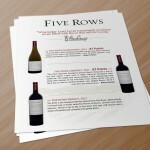 The company also wanted a sell sheet that the distributors could also download to hand out to accounts.